Located on the Big Cypress Bayou between Jefferson and Uncertain, Texas, explore some of the most mystical paddling our state has to offer with this 3-mile loop trail. From Marshall, TX: Take Hwy 43 north for 14.7 miles; turn left onto FM 134 West and travel 3.5 miles; turn Right on Longs Camp Rd, CR 2403, travel to the end of the road (less than 1 mile). From Jefferson, TX: at the State Hwy 59 and State Hwy 49 intersection at the traffic light, turn east onto State Hwy 49. Travel 0.4 miles and turn right onto FM 134 East, travel about 1.2 miles to the flashing red light and turn left staying on FM 134 East. Travel for about 8 miles. Turn left onto Longs Camp Road, CR 2403, travel to the end of the road (less than 1 mile). 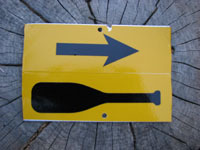 Trail Markers: Each Caddo/Big Cypress Bayou Paddling Trail is marked with unique reflective arrow signs attached to trees and posts to guide paddlers. This trail&apos;s marker is a yellow arrow sign (shown right). The Old River II Loop Paddling Trail heads upstream and to an old oxbow of the bayou. It has still, shallow waters and along the bank is a beautiful bottomland floodplain forest. Along with bald cypress trees, you will see overcup oak, willow oak, water elm trees, and numerous species of hickory trees. There is also a very diverse list of herbaceous aquatic and terrestrial plants to see. This route is excellent for fishing and watching wildlife including white-tailed deer, raccoons and other mammals and many colorful migratory birds busy rearing their next generations. Listen for the frogs, toads, and owls that also call this trail home. 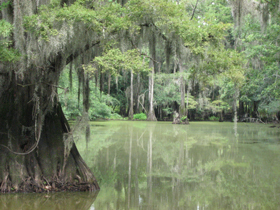 Caddo Lake consists of both river (Big Cypress Bayou) and backwater swamp. Lake-of-the-Pines is the nearest water control structure on the Bayou and is just up river of Jefferson, Texas, just a short distance west of Caddo Lake. The Bayou is very popular and will have seasonally heavy motorboat traffic. 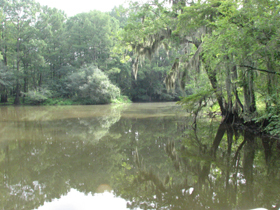 The backwater swamp also experiences motorboat traffic under the right water level conditions, and water levels are highly variable in the swamp. Also be aware that hunting is permitted on surrounding property which includes duck hunting in the winter months. Swimming in the swamp is not recommended. 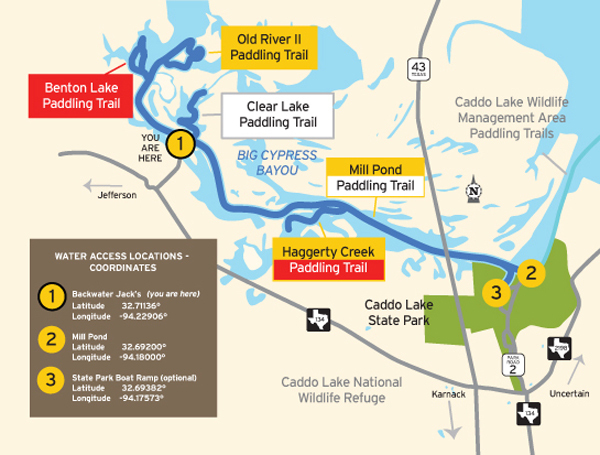 Find information on additional paddling trails along Big Cypress Bayou and Caddo Lake. Fisherman can find bass, crappie, and numerous species of panfish. It is also fun to fish for bowfin and pickerel. Ask at any Caddo Lake bait shops what is on the fishes&apos; menu. The bald cypress swamp and bottomland hardwood forests will surround paddlers with diverse flora and fauna which includes approximately 189 species of trees and shrubs, 75 grasses, 42 woody vines, and 47 animals. You will likely hear and see green and gray tree frogs, bullfrogs, spring peepers, narrow-mouth toads, cricket frogs. More than 200 kinds of birds species including Wood Ducks, Hooded Mergansers, Mallards, Blue-winged Teal, cormorants, Anhingas, Barred Owls, nesting Northern Parulas, Yellow-throated Vireos, Acadian Flycatchers, Pine Warblers, Black-and-white Warblers, Prothonatary Warblers, Pileated Woodpeckers, Red-shouldered Hawks, Mississippi Kites, Great Blue Herons, Great Egrets, Snowy Egrets, Little Blue Herons, late summer Wood Storks, and Roseate Spoonbills. Over 90 fish and reptiles including many turtles (sliders, stinkpots, and softshells), snakes (such as various non-venomous watersnakes, ribbon snakes, and cottonmouths), and an occasional alligator. There are 47 species of mammals known to be found on Caddo lake including beaver, nutria, mink, white-tailed deer, feral hogs and lots of squirrels. Paddlers can&apos;t miss the tall, Spanish moss-draped bald cypress trees, persimmon, and water elm. Paddlers will float through spatterdock, American lotus, Cabomba, and if their timing is right, American featherfoil and carnivorous bladderworts floating in the still water of the lake. Respect private property by not trespassing or littering and keeping noise levels down. This river and lake are classified as navigable, which permits public use of the streambed and, if necessary, the banks to portage any hazard. Any other use of private river banks without permission of the landowner can be considered trespassing. Under Texas Penal Code (§30.05), criminal trespass occurs when one enters property after receiving notice not to enter. Notice includes verbal notice, a fence, sign(s), purple paint on posts or trees, or the visible presence of crops grown for human consumption. Located right on the banks of the beautiful Big Cypress Bayou between Karnack and Historic Jefferson on Highway 134, visitors can enjoy RVing (all sites are full hook-ups) and rustic tent camping, boating, canoeing, fishing, and wildlife and bird watching. We have canoes to rent, firewood, ice, and a boat ramp. Clean and modern bathhouses and a game room. Coming soon: Cabins!!! Boat ramp fee for non guest is $3.00. Historic town located only 7 miles from Backwater Jacks RV - worth the drive. It has numerous antique stores, restaurants, and even an Old General Store. Visit our county seat with a population of about 24,000. Experience the Fire Ant Festival in October and the Festival of Lights which runs from November through January 1st. Downtown Marshall has many shops for visitors and locals. Marshall Convention & Visitors Bureau, 903-702-7777. Stop in to a local institution that has been around several decades. Although we lost the original building in a fire a couple of years ago, you can still get some of the best fried catfish, hush puppies, and coleslaw on the bayou at their new establishment. Highly recommended. Pop in to one of our newer bayou restaurants where you can try some alligator or catfish with all the "fixins". Thick bald cypress and a tangle of aquatic plants thrive in the waters at Caddo Lake State Park, which consists of 484 acres on Caddo Lake down the bayou from Backwater Jack’s. Because the vegetation is so lush, much of the lake is really a maze of sloughs, bayous, and ponds. Activities enjoyed by visitors include camping, hiking, canoe and kayaking, picnicking, nature study, and fishing. The Caddo Lake WMA has 8,005 acres in Marion and Harrison Counties. On the Caddo Lake WMA visitors will see bottomland hardwood forests, upland pine-oak-hickory forests, and mature hardwood forests. 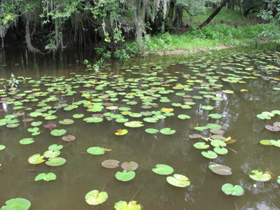 Visitors will also see flooded bald cypress forests and a very diverse collection of aquatic vegetation. WMAs are entry by permit only and Caddo Lake WMA offers primitive overnight camping, hunting, fishing, hiking, bird watching, photography, canoeing, and kayaking. www.tpwd.state.tx.us/huntwild/hunt/wma/find_a_wma/list/?id=104, 903-679-9817. Caddo Lake National Wildlife Refuge contains some of the best examples of mature flooded bald cypress forest in the United States and includes cypress tress nearly 400 years old. Nature and wildlife can be viewed on the Refuge from hiking, biking and equestrian trails, and an auto driving route. The Refuge also has hunting opportunities. 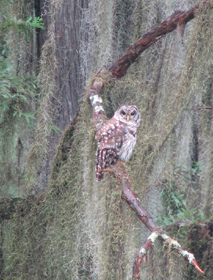 www.fws.gov/refuge/caddo_lake/, 903-679-9144. This trail was made possible through a partnership between Texas Parks and Wildlife Department, Backwater Jack’s R.V. Park, Greater Caddo Lake Association, Cypress Basin Chapter-Texas Master Naturalist, Friends of Caddo Lake National Wildlife Refuge, and TPWD-Caddo Lake Wildlife Management Area.